Giving thanks wasn't a challenge today because last year it was one of my resolutions to make it a daily habit. Wait, I take that back. While I do make it a habit to be grateful every day I realized that I fail to vocalize it to certain people who need to hear it. Typically, my prayers of gratitude are done in silence on my commute to and from work, or during my prayer times. I don't know when my Fridays evolved into stressful anxiety-ridden days at work. While most people in the office are thankful for Fridays I'm beginning to dread them. I try to walk into the building with a positive attitude and mindset believing things will be different. Today, I planned on breaking away during my lunch break to walk outside in the sunshine and find something I'm grateful for. It didn't happen. Hence, the photo above. 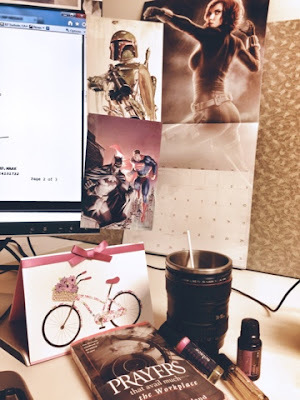 My caption on Instagram read: Giving thanks for whatever it takes to get me through this hellacious day at the cube farm: coffee, prayers, essential oils, and my super "friends." Stress, which leads to anxiety, which causes fatigue, clouds my lenses of gratitude. In this state it almost feels good to wallow in the muck of my distress. But I pull myself out of it fast because I know it is only causing me long-term harm. It's akin to binging on a box of Krispy Kreme donuts after eating clean for months. You're left with a cramping gut, nausea, and bile rising from your throat. And no, I've never binged on a box of Krispy Kreme donuts but after eating one and feeling horrible afterwards I could only imagine what 11 more would do. 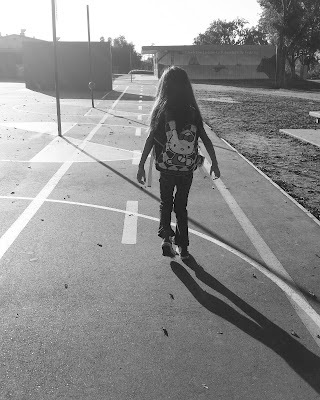 Now that I've completed Jeff Goins' 5-day Slow Down Challenge, what next? It's up to me to remember to slow down, take time to notice my world, savor my days, let go of control, focus on one task instead of manic multi-tasking, and give thanks to my loved ones.